Being straight of character, Sling doesn't think too deeply about things. He's evil, but has his dim, naive moments. His right arm becomes a Tail Bunker that pierces through his enemies, while his left becomes the Sling Shield to protect him. He's the gung-ho joe of the Destrons. Robot Mode: Sling is a basic-sized robot of similar (though not identical) design as several other Basic-class Beast Wars figures such as Iguanus and the first Megatron toy. He carries his beast mode head on his chest and most of the rest of the beast mode is on his arms, in his case the tail / weapon on his right and the fin / shield on his left. Sling has the usual ball joints, giving him superb articulation, and the detailing is as good as you’d expect on a figure this size. Unlike most Beast Warriors Sling seems to lack a ranged weapon, as the tail he carries on his right arm seems to be more of a stabbing weapon. There is no sculpted gun barrel there or anything. 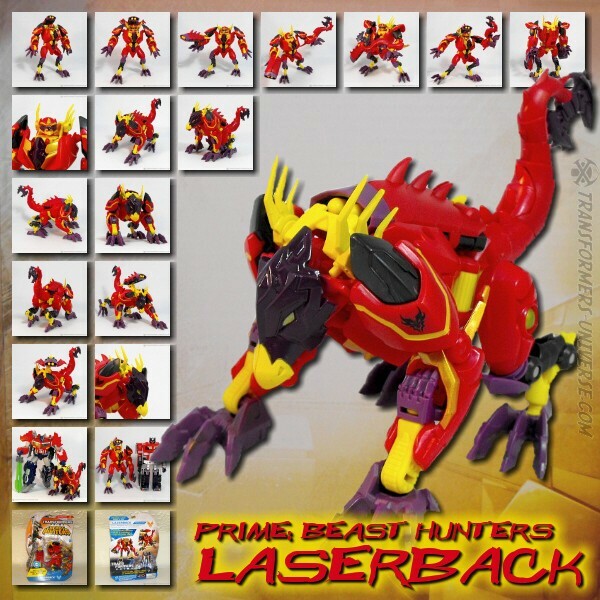 Another thing worth mentioning: Sling has got a rather strange Predacon faction symbol, as it’s in the middle of his chest underneath his beast mode head and it’s partially transparent, as you can look at it from front or back and the light shines through. Not sure what the idea here was, but it’s a nice little oddity. So bottom line: Sling is yet another example of the fine job Beast Wars (and its Japanese partner series) did in the Basic/Scout class. An all-around great little robot mode here, nothing too special, but nothing worth complaining about, either. Beast Mode: Sling transforms into a Dimetrodon, which – contrary to popular opinion – is not a species of dinosaur, but rather a member of the so-called Synapsida or mammal-like reptiles, which have more in common with mammals than either lizards or dinosaurs. Oh, and they predate the existence of dinosaurs by about 40 million years, too, having gone extinct around 272 million years ago, give or take. Sling’s beast mode has just one major flaw and it’s that you can still see the robot mode’s legs underneath the beast, they are not really all that well disguised. It’s nowhere near as bad as Dinobot, mind you, but we have seen better disguises. Apart from that, though, a good beast mode. The mouth of the Dimetrodon opens and closes, the detailing looks good, and if you’re looking at it from the top, no trace of the robot mode. Not perfect, but okay. Trap Mode: Like most of the Beast Wars Neo Destrons, Sling also has a third mode, called a trap mode, designed to lure unsuspecting enemies into a ... well, trap. In Sling’s case he becomes what is supposed to be a flower. Basically it’s the Dimetrodon lying flat on its stomach with the spinal sail opening up. It doesn’t actually look like a flower at all, mind you, but the trap part works, as the ‘flower’ snaps shut like a jaw trap when anything touches the interior of it. So while I wouldn’t really consider it a third mode as such, it’s a nice gimmick. Remarks: I can’t really say much about Sling as a character, as I’ve only seen a few episodes of Beast Wars Neo and only in Japanese with no subtitles. He was one of the bad guys, yes, but that’s pretty much it. As a toy Sling is solid. Not extraordinary, not in any way super special, but solid. I picked him up for a few bucks at a convention and – being a Beast Wars completest – don’t regret it.